The National Science Foundation gave University of Wyoming researchers a $100,000 grant for the first real test of nano robot swarms to see if they can can detect sources of chemical or biological hazards. Equipped with sensors, the robots continually sense the chemical concentration emitted from the source, and the air flow. They then perform mathematical calculations that allow them to quickly form a geometric lattice formation, and the robots move together to converge on the target. 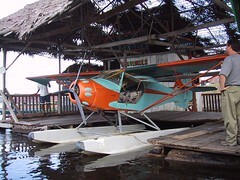 An airplane hanger on the Amazon River in Peru. (Found on flickr). This week I added a new category to Patent Room for train patents. The collection includes drawings of locomotives, rail cars and related items such as railway lights. This week I'm adding eight patent drawings of trains to the collection. After that I will mix in new designs along with drawings for the car, architecture and toy collections. 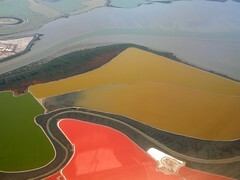 This is a beautiful photo, found on Flickr, shot out an airplane window of colored waters surrounding San Francisco Bay. This isn't quite flying cars, but USA Today notes that sales of private airplanes are taking off because of technology that makes them easier to fly. People who can afford small planes are able to avoid the lines, inconvenient schedules and increased security checks of flying on commercial airlines. "That's why people are buying their own planes — they found a way to take command of their lives," said Bruce Holmes, who founded NASA's Advanced General Aviation Transportation Experiment, which is trying to widen the use of private planes.